Home » Health & Wellness » Healthy Lifestyle » Heartburn, Acid reflux…How do I get relief? A Q&A with Loraine Dailey, M.D. Q: I’ve heard acid reflux can be serious. Is that true? A: If you’ve been taking antacids and refraining from eating lots of different foods, but you still have acid reflux- or “heartburn”- you may have what doctors term GERD. GERD stands for GastroEsophageal Reflux Disease. And yes, while the symptoms are annoying, GERD can also be serious and cause long-term damage if left untreated. A: At the entrance to your stomach is a valve called the lower esophageal sphincter (LES.) Normally, the LES closes as soon as food passes through it. If it doesn’t close all the way, acid in your stomach can move up into the esophagus, irritating the lining. Symptoms can include burning chest pain/heartburn, a sour taste in the mouth, nausea and other pain. If you have symptoms more than twice a week, you should talk with your doctor. We know that untreated GERD can cause damage, such as esophageal bleeding and increase a person’s risk of esophageal cancer. Plus, newer treatments and lifestyle changes can make you feel better fairly quickly. Q: What are the latest treatments? A: If the GERD is not serious, the first course of treatment should focus on lifestyle changes. Patients should avoid or reduce foods that trigger symptoms or weaken the LES—common culprits include chocolate, fried or fatty foods, coffee, alcohol and peppermint. Other changes include losing weight, not snacking several hours before bedtime, quitting smoking and evaluating any medications that could make GERD worse. Some people benefit from raising the head of their bed by six inches or sleeping on a wedge to prevent acid from moving up into the esophagus. For some, treatment may also require medication. We have an effective class of medications called proton pump inhibitors. They are sometimes combined with over the counter medications, such as antacids or foaming agents to coat the stomach. Other drugs, such as H2 blockers, help some people. If medications don’t work, there are surgical options but they are being used much less today. 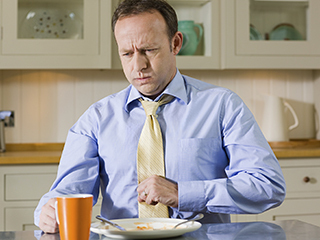 Talk with your doctor if you have persistent heartburn or think you have GERD. Together, you can come up with an effective treatment plan. Dr. Dailey is a Maryland Primary Care Physicians, LLC partner and is certified by the American Board of Family Medicine. She received her medical degree from the University of Virginia School of Medicine in 1976 and completed her residency program in Family Practice at University of Maryland Medical Center in 1979. Dr. Dailey is also a Fellow of the American Academy of Family Physicians.